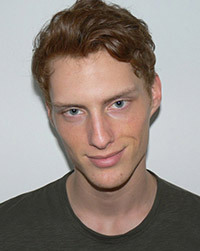 Gordon Bothe was born in Stockholm, Sweden, in 1990, is a Swedish male model. He likes to travel, football and nature. His guilty pleasure is chocolate. Scandinavia SSAW, GQ Italia, August Man Malaysia, GQ Mexico, Lui Magazine Italia, D'Scene Magazine, Essential Homme, Vogue China Men, GQ Style Germany, BMM Magazine, FHM Collections Germany, Flaunt, V Magazine, AndMen. Calvin Klein CK Jeans, Gucci Advertorial: CONCRETE FALL FASHION, Messagerie, Corneliani, Carlo Pignatelli, Allegri, Ballantyne, Nicole Farhi, Lacoste, Benetton, D&G. Walked runway for Dolce & Gabbana, Balmain x H&M, Brioni, Massimo Rebecchi, Christian Pellizzari, Stella Jean Men's Show, Ermanno Scervino, Etro, Tiger of Sweden, Hogan, Roberto Cavalli, Pringle of Scotland, Bottega Veneta, DUNO, Henry Cotton's. Represented by agencies New York Model, Premier Model Management London, Nathalie Models Paris, Kult Model Agency Hamburg, Scoop Models Copenhagen, Donna Models Tokyo, I LOVE Models Management Milan. I have big hopes for my future. I dream big. I always push myself to do the best job I can and to be professional. I was probably one of the worst dressed people even though I didn’t realize it until I started modeling.